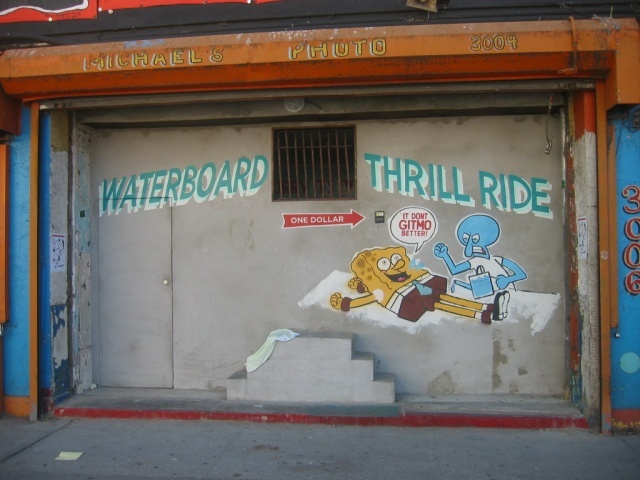 At first you don't realize what this is because the sight of merry SpongeBob throws you off. How it works is this: put your dollar in the slot, walk up the little set of stairs and look through the bars. Inside are two full-size mechanized figures. One is pouring water into the mouth of the other one, who, dressed in an orange jumpsuit and wearing a blindfold, is bound to a table. "Don't Worry, It's Only a Dream" says the sign on the wall.